30-Mar-2009 -- During March 2009 (a long time ago!) we took a trip to Shashe Camp in Botswana. 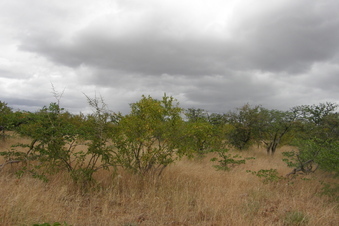 This private reserve borders the Tuli Circle and the Shashe River. Before we left for our holiday, we obtained permission from the owners of Jwala, another private reserve in the area, on which the 22S 29E confluence resides, to traverse their land. We planned a full days trip to get from Shashe Camp to the Confluence on Jwala. Hats, sun cream, food, and cooler boxes packed, we hopped onto our open top Toyota Landcruiser and started a ±30 km trip up the Tuli Circle, a rocky dirt road which is effectively the border between Zimbabwe and Botswana. The relatively long, hot, and treacherous journey eventually took us far enough North and West to reach Jwala reserve. We left the Tuli Circle and navigated the reserve, getting as close as possible to the Confluence. The closest point on the dirt roads was about 200 meters away from the Confluence. We then took a walk through the African Wild, until we came to the exact spot. Apologies to all involved for me taking so long to submit this. The Confluence is located about 3.6 km WSW of the Tuli Circle which demarcates the borderline with Zimbabwe.